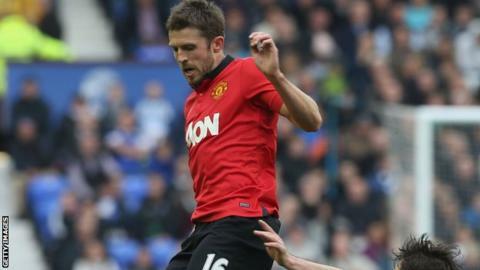 Manchester United's Michael Carrick will miss at least the first month of the season after suffering an ankle injury in training. The midfielder, 32, will be out for up to 12 weeks after undergoing surgery. The club tweeted: "Michael Carrick has had surgery this morning on his left ankle ligaments and will be out for 10-12 weeks." Carrick's absence was confirmed on the day that Louis van Gaal was unveiled as the new Manchester United manager. The Dutchman did not give details of the injury when he faced the media for the first time on Thursday. But, when asked about captaincy contenders and revealing Carrick's injury, Van Gaal said: "It is a big blow because he is a very experienced player."